The final seconds in the life of a very massive star are captured in 3-D by an MSU-led team of scientists. 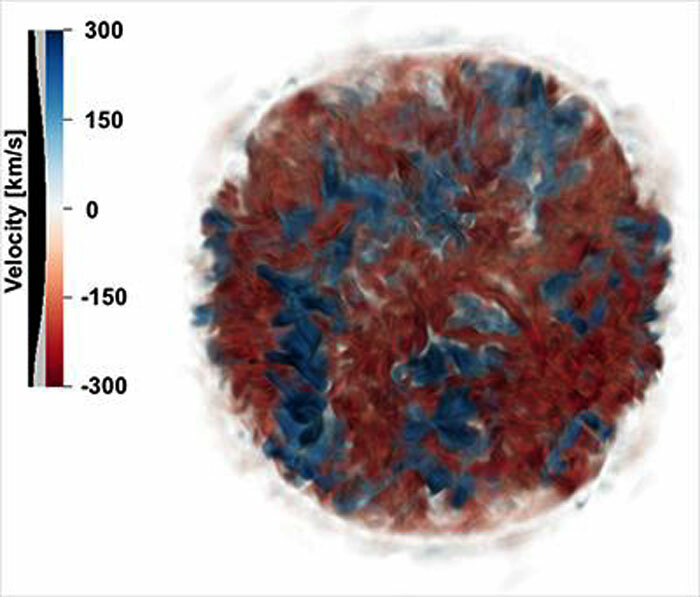 This is the first time a 3-D model of such a star has been developed and could lead to a better understanding of why these stars blow up as supernovae. Image courtesy of S.M. Couch. Giant stars die a violent death. After a life of several million years, they collapse into themselves and then explode in what is known as a supernova. How these stars explode remains a mystery. However, recent work led by Michigan State University may bring some answers to this astronomical question. In a paper published in the Astrophysical Journal Letters, the team details how it developed a three-dimensional model of a giant star's last moments. "This is something that has never been done before," said Sean Couch, an MSU assistant professor of physics and astronomy and lead author of the paper. "This is a significant step toward understanding how these stars blow up." The ongoing problem is that, until now, researchers have only been able to do this in one-dimension. Nature, of course, is three-dimensional. "We were always using one-D models that don't actually occur in nature," Couch said. What allowed the researchers to break the 3-D barrier is new developments in technology. "There are new resources, both hardware and software, that allow this to now be feasible," Couch said. Until now, computer models did not match what was observed in the real world. "We just couldn't get the darn things to blow up," he said. "And that was a problem because that's what happens in nature. It was telling us that we were missing something." The other problem the 3-D model addresses is the actual shape of the star. Older computer models yielded stars that were perfectly spherical. However, that is not what real stars look like, and this new work shows that the messy details matter for understanding supernova explosions. Millions of years of nuclear burning in massive stars results in central cores made of inert iron. This iron cannot be used by the star as fuel. Eventually, without any fuel source, the star collapses from its own tremendous gravitational pull. "This is what we see in our simulation process," Couch said. "The iron core building up to where it can no longer support itself and down it comes." He said the development of the 3-D model is an early stop in pinning down the reasons why stars explode, but could completely change the way scientists approach the supernova mechanism. Other members of the research team are Emmanouil Chatzopoulos of the University of Chicago; W. David Arnett from the University of Arizona; and F.X. Timmes from Arizona State University.